When I was growing up marmalade meant one thing: a citrussy concoction with bits of peel in it, related to jam but somehow more complicated in flavour and less obviously sweet. It was also one of the only things my father ever cooked – it still is – and although he comes up with all sorts of variations on the theme, one or more members of the citrus family are always the star ingredients, and perfectly sliced peel an essential element. I think this is generally the case in the UK today, though the earliest origins of the name lie with a smooth Portuguese quince concoction and over centuries the word has applied itself to many different kinds of fruit jam in other European countries (for full marmalade history and lots of recipes see my friend Elizabeth Field’s wonderful work). Of course I am so conditioned by citrus that oranges are always the first fruit that spring to mind when I read the word, and I’ve been reading it a lot recently as I continue my pursuit of Charles Fourier’s gastrosophic (or truly gastronomic) vision – and his sweet tooth. Fourier seems to love marmelades, and constantly suggests them as one of the ideal and economical foods of Harmony, especially for women and children. The Néo-Physiologie du Gout par Ordre Alphabétique (1839) confirms that in France in this period a marmelade was simply the type of jam that uses the whole of the fruit, as opposed to a jelly, made with only the juice. Its marmelade section discusses everything but citrus, and although there is a brief, all inclusive description of citrus marmelade under the citron entry, this requires passing the cooked peel through a sieve to produce a smooth preparation – sacrilege on my breakfast table! Although I know some people chop their marmalade peel finely with a food processor, and Fourier himself was expecting an un-bitty preserve, I’m afraid I simply can’t bring myself to make you a puréed or strained marmalade, especially not while Seville oranges are in season. 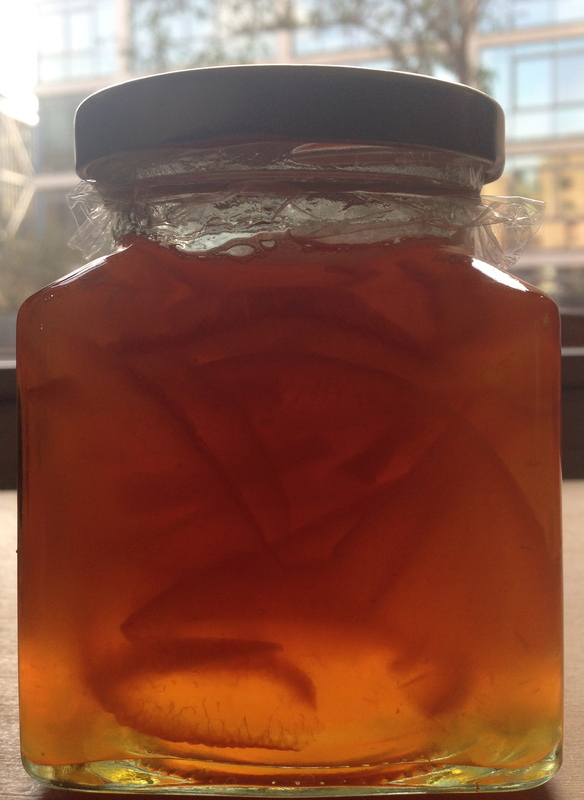 You can click here for a basic recipe for a very British orange marmalade, passing on as many tips from my father as I could glean. It might not be what Fourier had in mind for his Harmonians, but as far as I’m concerned it brings you as close as you can get to marmalade perfection.